The film was released by 20th Century Fox in Canada and the U.S on 27 February 2016 and by Lionsgate in the UK on 28 March 2016. In 2017 it was nominated for the Empire Award for Best British Film. In 1973, ten-year-old Michael Edwards dreams of Olympic glory, practising in various Olympic events and failing miserably. His mother unconditionally supports him, while his father constantly discourages him. As a young teen, he gives up his dream of participating in the Summer Games in favour of skiing in the Winter Games. Although successful at the sport, he is rejected by British Olympic officials for being uncouth. Realising he could make the team as a ski jumper (a sport in which the United Kingdom had not participated for six decades), he decamps to a training facility in Garmisch-Partenkirchen, Germany. The more seasoned jumpers, specifically those on the Norwegian team, belittle him. He self-trains, and after successfully completing the 15-metre (49 ft) hill on his first try, he injures himself on his first try from a 40-metre (130 ft) hill. Alcoholic snow groomer Bronson Peary encourages Eddie to give up, but Eddie's tenacious spirit and shared feelings of ostracism by the other jumpers there convince him to train Eddie. Peary is a former champion American ski jumper who left the sport in his 20s after a conflict with his mentor, famous ski jumper Warren Sharp, which Eddie learns from Petra, the kind owner of a nearby tavern. With very little time to qualify for the 1988 Winter Olympics in Calgary, Alberta, Eddie and Bronson employ various unorthodox methods to condition and refine Eddie's form, and he successfully completes the 40m hill. To qualify for the British Olympic division in ski jumping, Eddie only needs to complete a jump from a 70-metre (230 ft) hill in order to qualify for the Winter Olympics. Not long after, he manages to land the jump successfully, with a distance of 34 metres (112 ft), thus winning a place on the British Olympic Team. However, the officials, in an effort to keep Eddie from sullying the Winter Games with his amateurish skillset, decide to change the rules and demand that he jump at least 61 metres (200 ft). Though discouraged, Eddie decides to continue training and performs on a circuit, his jumps increasing in length each time, but unable to meet the Olympic requirements. During a practice jump at the final event before the cutoff date for qualification, he lands a 61m jump exactly, but on his official jump, he falls and is disqualified. Eddie is devastated and resolves to return home to work with his father as a plasterer, but he receives a letter claiming that his qualifying practice jump is valid, and he happily tells Bronson that he is eligible to compete in the Winter Olympics. Bronson tries to dissuade him, promising that he will make a complete fool of himself and his country if he goes, but Eddie is undeterred, noting that competing in the Olympics was always enough for him. Upon arriving in Calgary, he receives instant scorn from the other British athletes, who get him drunk and nearly provoke him into fighting after he is subsequently absent from the opening ceremonies. Despite finishing last in the 70m jump with 60.5 metres (198 ft), Eddie sets a British record. His triumphant celebrations win the audience over, and the media embrace him as Eddie "The Eagle". Over the phone, Bronson criticises Edwards for not taking the sport seriously. Edwards publicly apologises to the press for his antics and, wanting to ensure he does not leave the games as little more than a novelty, he enters the 90-metre (300 ft) jump, which he has never attempted before. Bronson decides to travel to the games and support him. After an encouraging conversation with his idol Matti "The Flying Finn" Nykänen on the lift to the top of the hill, Eddie barely manages to land a 71.5-metre (235 ft) jump. Once again, he scores last in the event, but is nonetheless cheered by the audience as well as millions around the world, which includes a playful salute in the closing speech of the President of the Organising Committee for the Olympic Games, Frank King, who said "You have broken world records. You have established many of your own personal bests and some of you have even soared like an Eagle". British Olympic officials grudgingly accept him. Warren Sharp reconciles with Bronson, who was present, and Edwards returns home a national hero to the cheers of his fans at the airport; his mother rushes to him, embracing him. As Eddie looks to his father, he reveals a jumper declaring his support before then embracing Eddie as well. Eddie the Eagle is a co-production of Marv Films (UK), Studio Babelsberg (Germany) and Saville Productions (US). Development on the film was first reported in 2007 as a project of Irish director Declan Lowney with Steve Coogan to appear in the lead role. In 2009 Rupert Grint was reportedly linked to the role of Edwards. In March 2015, it was announced that 20th Century Fox had acquired the film, with Taron Egerton and Hugh Jackman starring and Dexter Fletcher directing, from a screenplay by Sean Macaulay and Simon Kelton. Egerton would portray Eddie "The Eagle" Edwards, while Jackman would portray Bronson Peary, his coach; Jackman's character was confirmed as fictional by Eddie Edwards. It was also announced that Matthew Vaughn, who produced Kingsman: The Secret Service, would reunite with the studio, serving as a producer on the film, while Adam Bohling, David Reid, Rupert Maconick and Valerie Van Galde would also serve as producers. That same month, it was announced that Christopher Walken had joined the film, portraying the role of Jackman's character's mentor. The film received funds of €2.2 million, from the German Federal Film Fund (DFFF). Principal photography took place in Oberstdorf and Garmisch-Partenkirchen in Bavaria, in Seefeld in Tirol, at the Pinewood Studios and in London from 9 March to 3 May 2015. Dry slope scenes were filmed at a dry ski slope in Bracknell, Berkshire, UK. In March 2015, it was announced 20th Century Fox would distribute the film in the United States of America. The studio set 29 April 2016 for the release of the film. That same month, it was announced that Lionsgate had acquired United Kingdom distribution rights to the film, with a spring 2016 release planned. In October 2015, Lionsgate set a release date for the film for 1 April 2016. The date was then moved forward to 28 March 2016. The same month, it was announced that the film had delayed to 26 February in the United States. The film had its world premiere at the 2016 Sundance Film Festival as a "Surprise Screening" on 26 January 2016. The subsequent London premiere took place on 17 March 2016. Fly (Songs Inspired by the Film Eddie the Eagle), curated by Gary Barlow, was released on 18 March 2016. It features new songs by Tony Hadley, Marc Almond, Holly Johnson, Paul Young, Kim Wilde, Andy Bell, Midge Ure, Nik Kershaw, ABC, Deacon Blue, Van Halen, Go West, Howard Jones, OMD and Heaven 17. It is an album of new studio recordings and original songs, curated by Barlow at the behest of producer Matthew Vaughn. Eddie the Eagle (Original Motion Picture Score) was released a week before the curated album above, and features the film's original score by Matthew Margeson. Eddie the Eagle grossed a worldwide total of $46.1 million. In the UK, it grossed $12.8m making it the highest grossing British film released in the UK in 2016. On Rotten Tomatoes, the film has a rating of 80% based on 167 reviews, with an average rating of 6.5/10. 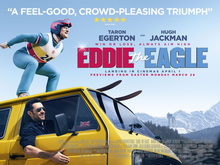 The site's consensus reads, "Eddie the Eagle's amiable sweetness can't disguise its story's many inspirational clichés – but for many viewers, it will be more than enough to make up for them." On Metacritic the film has a score of 54 out of 100, based on reviews from 34 critics, indicating "mixed or average reviews". Audiences polled by CinemaScore gave the film an average grade of "A" on an A+ to F scale. Alonso Duralde of TheWrap wrote, "Eddie the Eagle is designed for audiences who will throw their weight behind the film’s schmaltz and sentimentality. Anyone unwilling to commit to the movie’s shamelessness will feel like they’ve hit the ground headfirst." KenyaBuzz called it a must-watch saying it is "positively impetuous and unbearably affectionate." A reviewer who attended the events in which the real Eddie competed, wrote "three generations of my family loved this film. You can't believe most of it, but you can believe in it. That's a subtle but important difference." ^ "EDDIE THE EAGLE (PG)". British Board of Film Classification. February 11, 2016. Retrieved February 11, 2016. ^ Lang, Brent. "Box Office: 'Gods of Egypt' Falling Flat, 'Deadpool' Still King". Variety.com. Retrieved February 25, 2016. ^ a b "Eddie the Eagle (2016)". Box Office Mojo. Retrieved July 4, 2016. ^ a b Fleming Jr, Mike (January 25, 2016). "'Eddie The Eagle' To Soar In Sundance Surprise Screening". Deadline Hollywood. Retrieved January 25, 2016. ^ Blaney, Martin (May 8, 2015). "World of Locations: Germany". Screen International. Retrieved April 10, 2016. ^ "Eddie the Eagle". British Films Directory. British Film Council. Retrieved April 6, 2016. ^ "Film Review: 'Eddie the Eagle'". Variety. Los Angeles: Penske Media Corporation. January 29, 2016. Retrieved April 7, 2016. ^ Tilly, Chris (8 August 2007). "Knowing me Steve Coogan, playing you Eddie the Eagle". Time Out. ^ Before Taron Egerton's casting, Steve Coogan was linked to the role of Edwards. "Eddie the Eagle Role". Retrieved March 10, 2016. ^ Sweeney, Ken (22 November 2009). "The Diary: Irish director makes leap of faith in casting for 'Eagle' biopic Archived February 17, 2010, at the Wayback Machine". Sunday Tribune (Tribune Newspapers). ^ a b c DeFore, John (March 13, 2015). "'Eddie The Eagle' Sundance Review". Deadline Hollywood. Retrieved January 25, 2016. ^ "Eddie the Eagle | Coming to theaters on Feb 26th, 2016". Eddie The Eagle | 20th Century Fox. Retrieved April 1, 2016. ^ Pulver, Andrew (June 8, 2015). "Eddie the Eagle: film of my life 'only 10%' accurate". The Guardian. ISSN 0261-3077. Retrieved February 9, 2016. ^ Pederson, Erik (March 13, 2015). "'Eddie The Eagle' Has Landed At Fox; Biopic Starring Taron Egerton, Hugh Jackman Set For 2016". Deadline.com. Retrieved January 25, 2016. ^ Anthony D'Alessandro (March 31, 2015). "Christopher Walken Joins Movies 'Nine Lives' & 'Eddie The Eagle'". Deadline Hollywood. Retrieved April 24, 2015. ^ Presse- und Informationsamt der Bundesregierung (January 20, 2016). "Staatsministerin Grütters – DFFF bleibt wichtiger Anreiz für einen attraktiven Filmstandort Deutschland" (Press release) (in German). Berlin: Cabinet of Germany. Retrieved April 1, 2016. ^ Evry, Max (March 9, 2015). "First Look at Hugh Jackman and Taron Egerton on the Set of 'Eddie the Eagle'". comingsoon.net. Retrieved March 9, 2015. ^ Tartaglione, Nancy (March 16, 2015). "Lionsgate UK Jumps For 'Eddie The Eagle'". Deadline Hollywood. Retrieved January 25, 2016. ^ Tartaglione, Nancy (October 15, 2015). "'Eddie The Eagle' Sets UK Landing Date; Stephen Fry Leaving 'QI' – Global Briefs". Deadline Hollywood. Retrieved January 25, 2016. ^ Tartaglione, Nancy (December 17, 2015). "'Eddie The Eagle' Trailer Swoops In With First Look At Underdog Ski-Jumper Story". Deadline Hollywood. Retrieved January 25, 2016. ^ "Eddie The Eagle European Premiere". Ikon London Magazine. March 18, 2018. Retrieved March 3, 2018. ^ Enterprises, Universal Music. "'FLY' Songs Inspired By The Film EDDIE THE EAGLE Released March 18, 2016". www.prnewswire.com. Retrieved May 16, 2018. ^ "Eddie the Eagle (2016)". Rotten Tomatoes. Retrieved June 21, 2016. ^ "Eddie the Eagle reviews". Metacritic. Retrieved March 29, 2016. ^ "'Deadpool' Overthrows 'Gods Of Egypt', 'Eddie The Eagle' At Thursday Box Office". deadline.com. ^ "'Eddie the Eagle' Review: Hugh Jackman Ski Tale Buries Audience in Avalanche of Feel-Good-Isms". The Wrap. Retrieved February 25, 2016. ^ "'Eddie the Eagle' Review: Sentimental Biopic Brings the Tears". www.kenyabuzz.com. Retrieved April 6, 2016. ^ Sharwood, Anthony (April 16, 2016). "Eddie The Eagle Starring Hugh Jackman Is The Best Worst Movie We've Seen For Ages". The Huffington Post Australia. Retrieved April 27, 2016. Matti Ensio Nykänen was a Finnish ski jumper who competed from 1981 to 1991. Widely considered to be the greatest male ski jumper of all time, he won five Winter Olympic medals, nine World Championship medals, and 22 Finnish Championship medals. Most notably, he won three gold medals at the 1988 Winter Olympics, becoming, along with Yvonne van Gennip of the Netherlands, the most medaled athlete at that Olympiad. Michael Edwards, known as "Eddie the Eagle", is an English ski-jumper who in 1988 became the first competitor since 1928 to represent Great Britain in Olympic ski jumping, finishing last in the 70 m and 90 m events. He became the British ski jumping record holder, ninth in amateur speed skiing, and a stunt jumping world record holder for jumping over 6 buses. Janne Petteri Ahonen, nicknamed "The King Eagle", is a Finnish former ski jumper and drag racer. He is one of the most successful ski jumpers of all time, as well as one of the most successful from Finland, having won two consecutive World Cup overall titles, the Four Hills Tournament a record five times, two individual gold medals at the World Championships, and the Nordic Tournament once. He has been described as the greatest ski jumper to have never won an individual Winter Olympics medal. Matti Antero Hautamäki is a Finnish former ski jumper who competed from 1997 to 2012. He is one of Finland's most successful ski jumpers, having won sixteen individual World Cup competitions; multiple medals at the Winter Olympics, Ski Jumping World Championships, and Ski Flying World Championships; the Nordic Tournament twice; and four ski flying world records. Letalnica bratov Gorišek is a ski flying hill and the biggest of eight hills located at the Planica Nordic Centre in Planica, Slovenia. It was built in 1969 and is named after the original constructors and brothers Vlado and Janez Gorišek. With a total of 28 world records set it is the world leading ski jump hill in this statistic. The world's steepest zip-line with average incline of 38.33% (20.9°) and maximum incline of 58.7% (30.5°) incline opened at the hill on 19 September 2015. 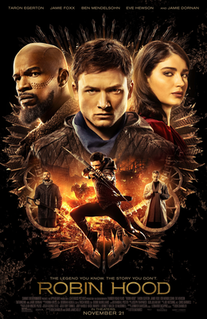 Robin Hood is a 2018 American action-adventure film directed by Otto Bathurst and written by Ben Chandler and David James Kelly, from a story by Chandler. It is a new telling of the Robin Hood legend, and follows his training by John to steal from the Sheriff of Nottingham. The film stars Taron Egerton, Jamie Foxx, Ben Mendelsohn, Eve Hewson, Tim Minchin, and Jamie Dornan. 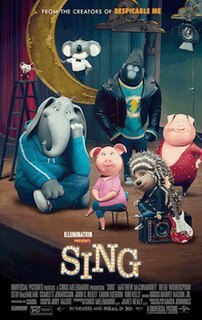 Sing is a 2016 American computer-animated musical film produced by Illumination. It was directed and written by Garth Jennings, co-directed by Christophe Lourdelet and starring the voices of Matthew McConaughey, Reese Witherspoon, Seth MacFarlane, Scarlett Johansson, John C. Reilly, Taron Egerton, and Tori Kelly. The film is about a group of anthropomorphic animals that enter a singing competition, hosted by a koala who is trying to save his theater. "Cowboy Song" is a song by Thin Lizzy that originally appeared on their 1976 album Jailbreak.